This morning we went into the city to check out Universal Electric Supply. This is one of those wonderful old-school well-rounded supply places that contractors go to for the good stuff. We were mostly taking a look at a few things for future reference: sometimes a place will be listed as a distributor when that has not been true for a couple years. In this case, it was all good, and we had a good time in the lighting showroom even if that large bronze pig turned out not to be a light fixture after all. 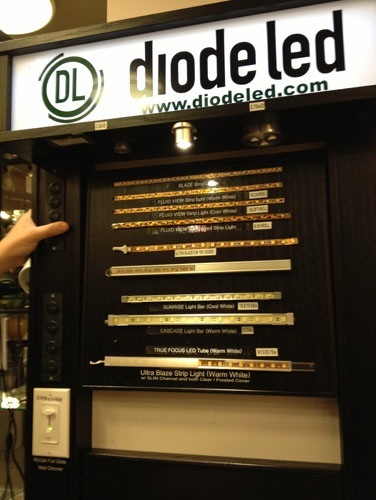 One thing that has really reached viability is the LED light strip for adding glow to a space. These are thin (1/16" in some cases) plastic strips with LEDs embedded in them. I'll spare you the picture where we turned on this display and were blinded by that one at the bottom that is called the Ultra Blaze. We also visited a tile showroom to look at some linear floor drains, which were smaller than I expected and acceptable to Noel so all is well there. A pretty decent morning of looking at stuff. When we got home Noel got right back to work upstairs. We are both very motivated to get the hallway rocked in because the weather is getting cooler and that is a GIANT HOLE in the house. We have the heat turned off so we're not heating the atmosphere, but it is awfully cold at night and as much as we enjoyed drinking our way through three winters with no heat, we're getting a bit old for that. 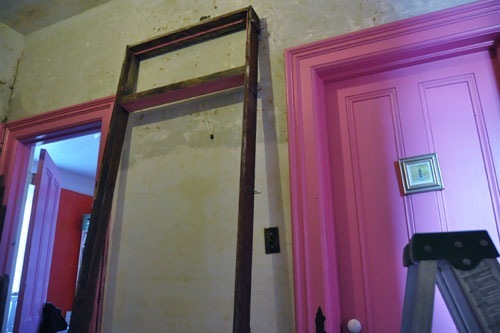 The first thing to do was strip the paint off the old door frame so it could be removed. After a hundred years or so of regular repainting there is enough paint on there to be problematic. So, back to work with the heat gun. I was outside (planting bulbs, as you do). 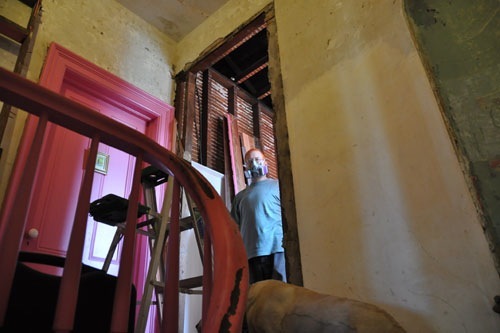 At one point Goldie and I came back inside to see how progress was going, and the door frame was out! 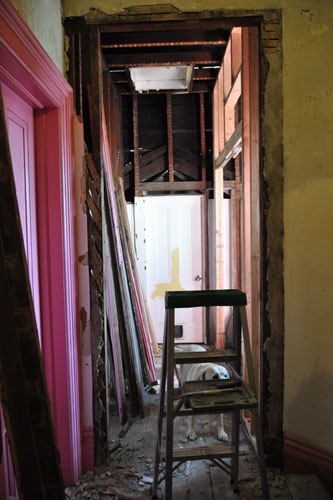 The old bathroom doorway is going to be removed and the hall will be one hall. 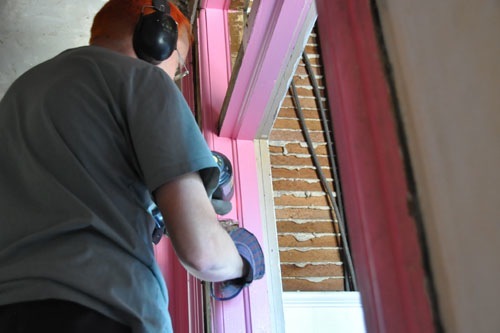 Noel's plan was to use the laser level to make a clean cut up the plaster that is over where the door used to be to open up that part of the wall. It actually worked quite well, though plaster dust got everywhere as it does. I stayed outside (while planting bulbs I found a huge cache of chunks of concrete and kind of lost all self control while digging them out). If you don't need to be around plaster being removed, I suggest you just avoid it. 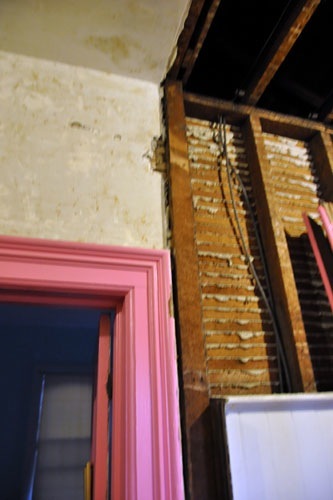 There's only one piece of framing wood left to remove beside the back bedroom door. The hallway is going to look so different, continuing back. 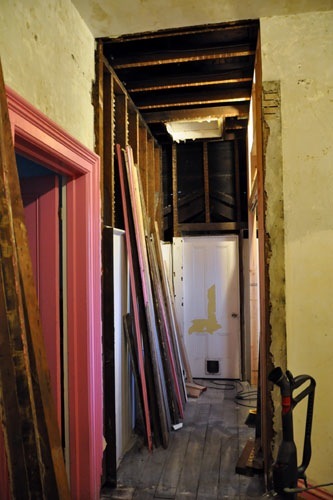 A little look forward to the day when we (with good luck and no more massive deregulated banking disasters) add on a couple rooms at the back on the second floor. With all this work and the showroom visits this morning, I feel like this whole project is coming together for me.